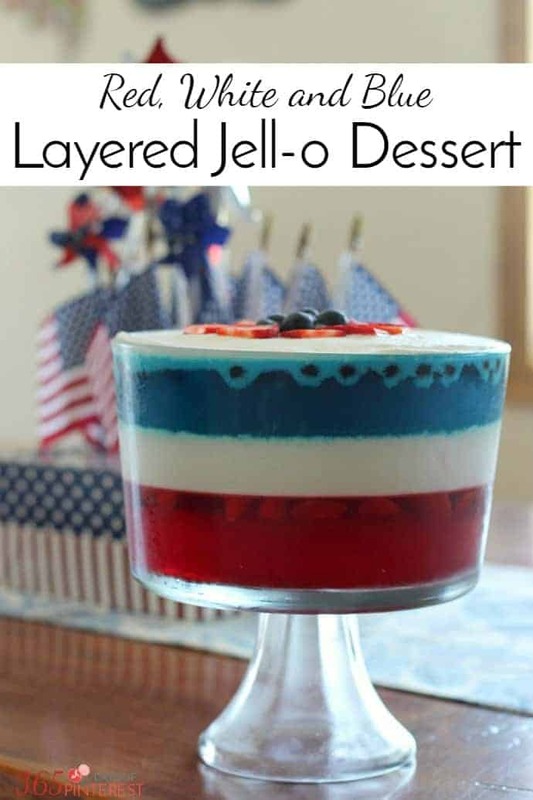 Layered Jello Dessert (or is it considered a jello salad?) is a time-honored family favorite. It’s light and refreshing and the addition of fresh fruit makes it even more special for summer holidays! I’ve been waiting almost a year to share this post with you! Jamie brought this to our family’s 4th of July celebration last year and it was so pretty that I just had to take a picture and put it on the blog! 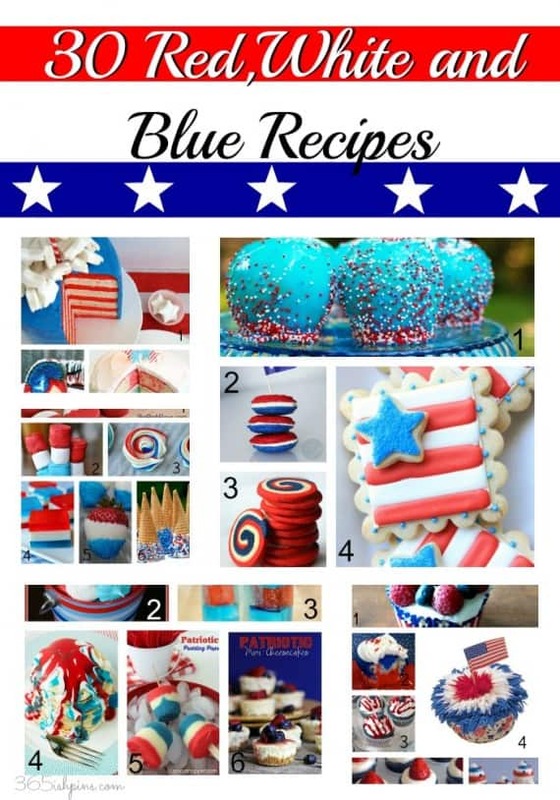 But, there’s not really any need for red, white and blue recipes after July 4th, so I had to save it until the next summer rolled around. Which is now! Yay! I think the thing that is most appealing is the crisp, clean layers. It just looks pretty! Jamie said that she got impatient and didn’t wait long enough for the blue layer to completely set, so the top layer of white bled through around the blueberries just a bit. I thought it looked kind of cool. It reminded me of lace. But if you want the nice clean lines like you can see between the red and white layer, be sure to wait long enough. This recipe is easy, but it does require a little bit of patience. 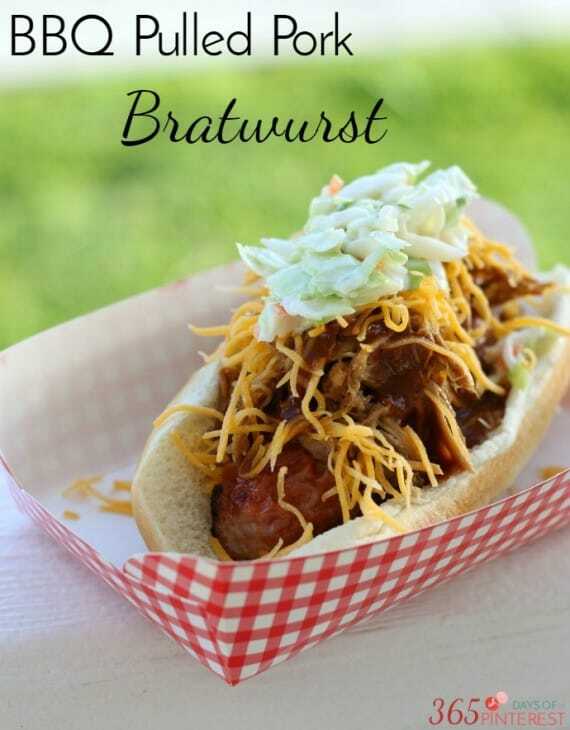 Make it the day BEFORE you are planning to go on a Memorial Day picnic! It’s just so pretty! I want to stick my finger in that whipped topping and swipe some right now! 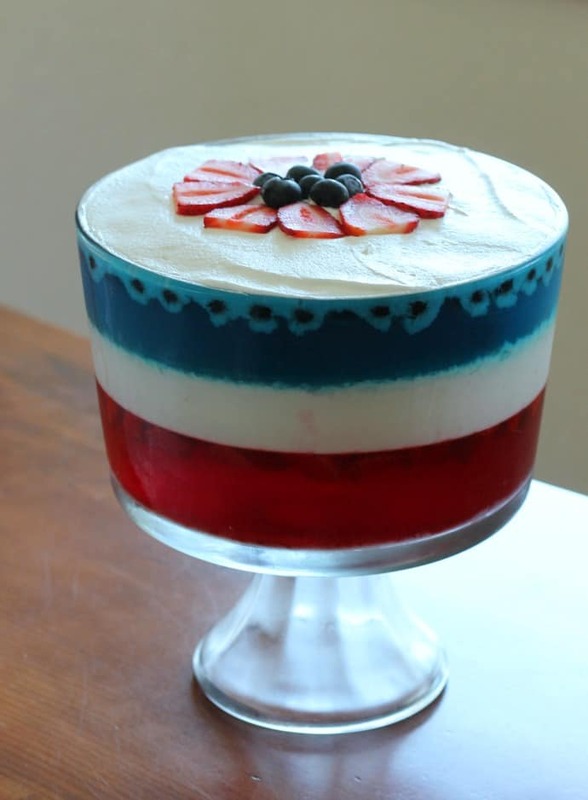 🙂 Plan on making this layered dessert (or salad, or whatever you want to call it) this year. You know the kids will be on board with this one! Dissolve raspberry or strawberry gelatin in 1 cup boiling water; stir in 1 cup cold water. Add raspberries or strawberries. 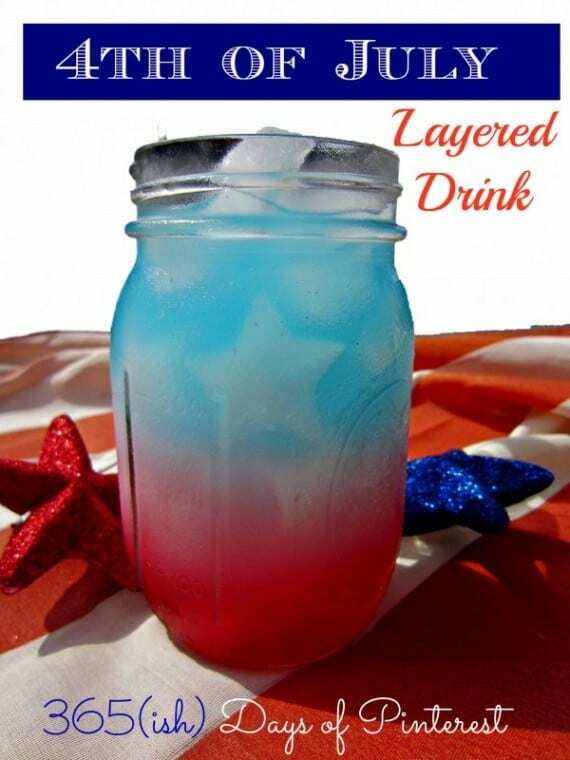 Pour into a 3-qt. trifle bowl. Refrigerate until firm, about 1 hour. In a saucepan, sprinkle unflavored gelatin over 1/2 cup cold water; let stand for 1 minute. Add cream and sugar; cook and stir over low heat until dissolved. Cool to room temperature. Whisk in sour cream and vanilla. Spoon over red layer. Refrigerate until firm. Dissolve berry blue gelatin in remaining hot water; stir in remaining cold water. Add raspberries. Spoon over cream layer. Chill until set. 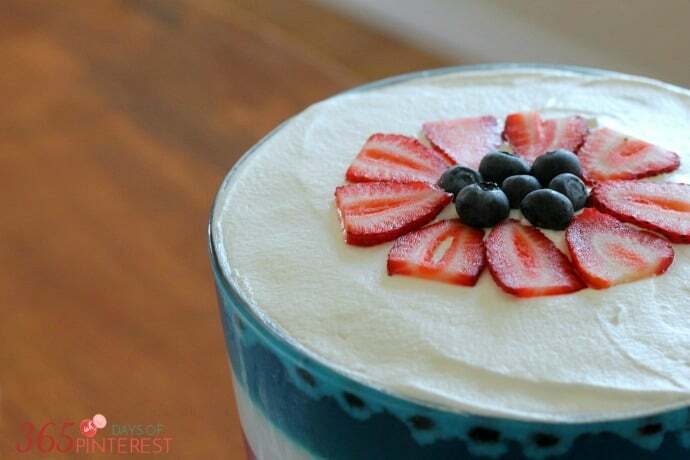 Top with whipped topping and berries if desired. 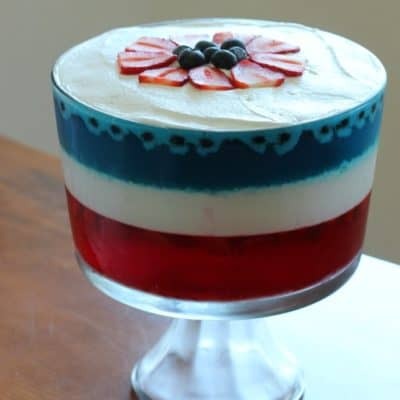 If you like this red, white and blue Jello dessert, check out some of my other summer holiday posts!